Throw out that WAP browser on your cell phone. We are quickly approaching a point where a full browser experience is available on our mobile devices. A startup called Skyfire is in some respect even further along than Apple in bringing the entire Web to your phone. 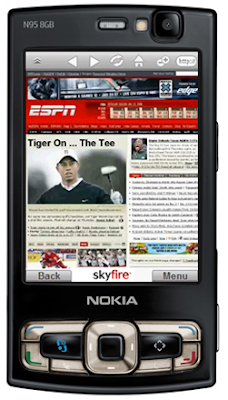 Its mobile browser lets you slide Web pages around and zoom in like with the mobile version of Safari. But it also supports Flash and Ajax sites. (It does this by offloading most of the heavy lifting to its servers rather than the mobile client). That means you can watch Youtube videos and go to Google Maps right in the mobile browser instead of having to download separate apps. In contrast, the iPhone’s Safari browser still does not support Flash and so to watch a video you have to launch the separate Youtube app. As it becomes possible to do more and more inside the mobile browser itself, it raises the question of whether that indeed is the killer app for mobile Web phones. For the most part, you still get a richer experience by downloading a separate single-purpose app to your phone. But efforts like Skyfire’s point to a future where that may no longer be necessary for all but the most sophisticated apps and games.